Apple Inc.’s latest Supplier Responsibility report indicates the company has stepped up its audits and training at a number of locations around the world. The report says the company conducted on-site audits at 102 facilities in 2009, up from 83 in 2008, and trained 133,000 workers, supervisors and managers, a sharp increase from 27,000 a year earlier. “During most of our audits, suppliers stated that Apple was the only company that had ever audited their facility for supplier responsibility,” the report declares. 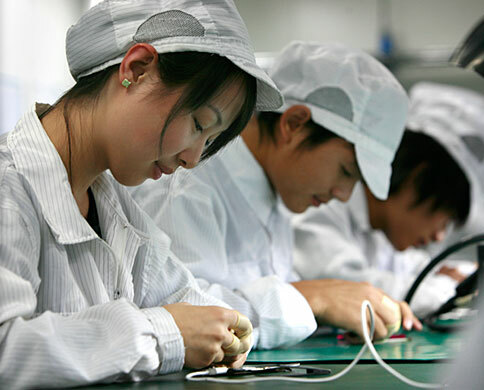 Its audits have involved facilities in China, the Czech Republic, Malaysia, the Philippines, Singapore, South Korea, Taiwan, Thailand and the U.S.
Apple’s code of conduct for suppliers covers expectations in five key areas: labor and human rights, health and safety, environmental impact, ethics and management commitment. And the company has issued standards on a number of topics including dormitories, juvenile worker protections, medical non-discrimination, pregnancy non-discrimination, prevention of involuntary labor, wages and benefits, and working hours. Apple said previous audits have revealed “a complex recruitment process” which has sometimes resulted in workers paying fees in excess of legal limits, in part due to fees involving third-party labor agencies helping recruit workers from other countries. The company said it requires suppliers to repay overpaid fees and workers have been reimbursed more than $2.2 million in overcharges over the past two years. Apple says its standard limits recruitment fees to the equivalent of one month’s net wages. It said it has found problems with suppliers in Taiwan, where companies often use contract workers from countries such as the Philippines, Thailand and Vietnam, and has conducted training and other programs to improve hiring practices. Apple said its audits of 102 facilities last year included 22 repeat audits and 80 first-time audits. Its summary of audit results indicated that the category of “management commitment” had the poorest results, with a 61% rating for both compliance and for systems in place. “Ethics” fared highest, 95% in compliance and 86% with systems in place; labor and human rights scored 72% in compliance and 67% in systems; health and safety, 76% compliance and 74% systems. Apple said audits turned up 17 “core violations” in 2009, including eight for excessive recruitment fees; three for hiring underage labor; three for improper disposal of hazardous waste; three involved falsification of records. Apple audits found 55 facilities that did not have “dedicated personnel accountable for compliance with all categories of Apple’s Code,” and it has required formal training programs for both workers and managers. NextBusiness Ethics in China: What Would Chairman Mao Think? The Most Important Climate Change Question: How Will Investors React? Is There a Culture of Secrecy Behind Corporate Responsibility?